Congratulations to American Pharoah, first Triple Crown winner in 37 years!!! Size: ~34 cm neckline, 35 cm long. 18 cm wide at top of triangle. Comments: A triangular dress front insert with choker collar, cream silk Maltese bobbinlace. Nice matted woven leaf work inside the triangle with a Maltese cross in the center. The edges and collar alternate crosses and flowers. The collar and insert appear to match. Soilage: Cream color, but that’s probably the natural thread. Sold for 116.00 GBP, 3 bidders. 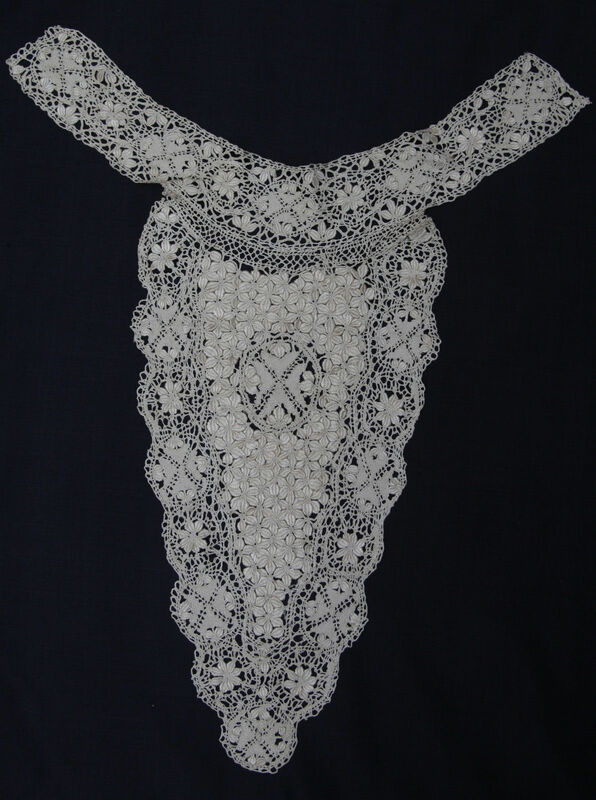 Comments: A long Irish Crochet collar with tightly worked unusual motifs. From the type of raised work used it might be a French piece (see especially the center back). I especially like the heavily padded rings. 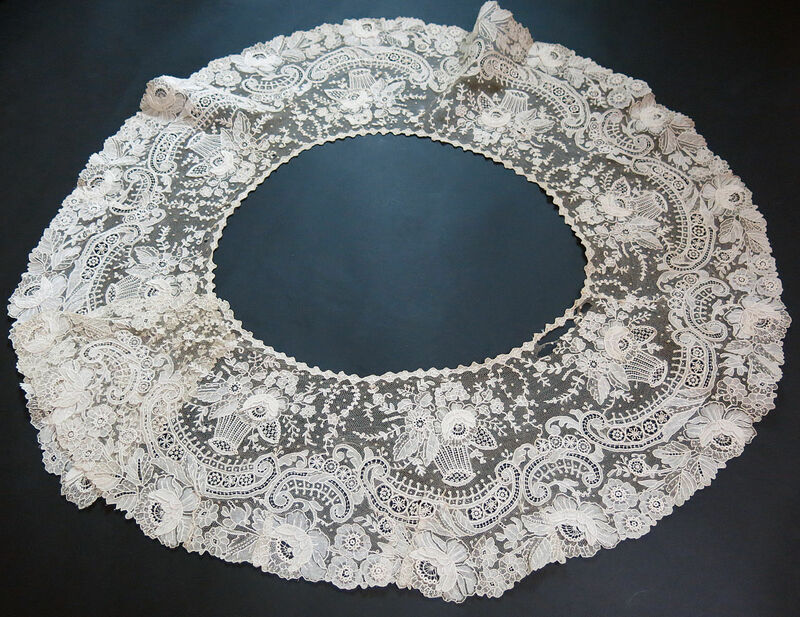 It retains the typical three part sprays that you virtually always see in Irish work, and the crocheted loop picots in the ground are not so typical of the more elaborate grounds of French work. Sold for 27.00 GBP, 4 bidders. 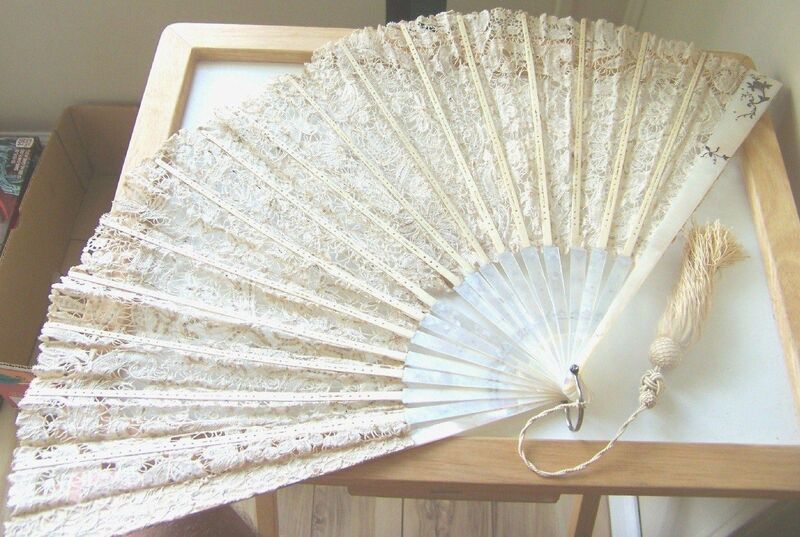 Comments: A rather large fan of Brussels bobbin and needlelace applique on machine net, with plain Mother of Pearl Sticks. 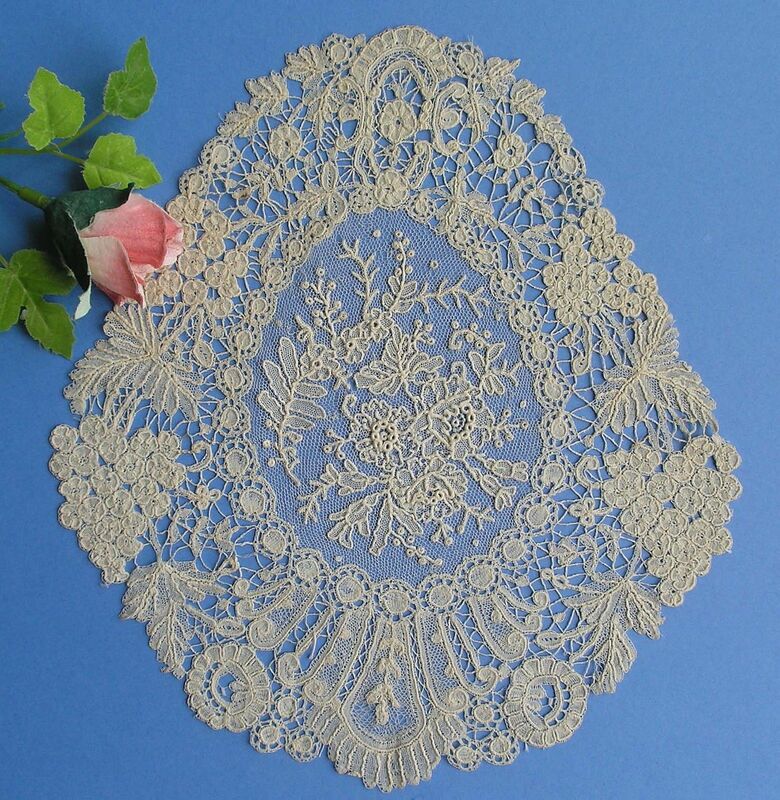 The lace is backed with a white gauze or net. Good romantic floral design – one of the center roses is done in Point de Gaze, but no PtdG ground that I can see. Fillings are needle-made and simple. Note the Rosaline perle-like small flowers in the center spray. Many small circular esprits in the tulle. Good romantic floral design with some interesting hanging flowers, not just roses and leaves. Damage: Nothing obvious from the photos. Sticks look in good shape. Looks like one small hole in the backing. Soilage: One small spot on the lace, and more brown spots on the backing cloth. Sold for $99.99, 1 bidder. Comments: A bobbinlace guipure dress front. I don’t recognize the type, but I’m guessing a French piece (seller thinks the same). Mainly because of the ground which is a little complex. And you do see the raised elements on some Cluny pieces. So I’d put it in my ‘unknown guipure’ category. It’s actually quite well done and has a nice presence. Soilage: It has been laundered (seller gives no details on the process) and is a soft old white color. Sold for 25.95 GBP, 4 bidders. 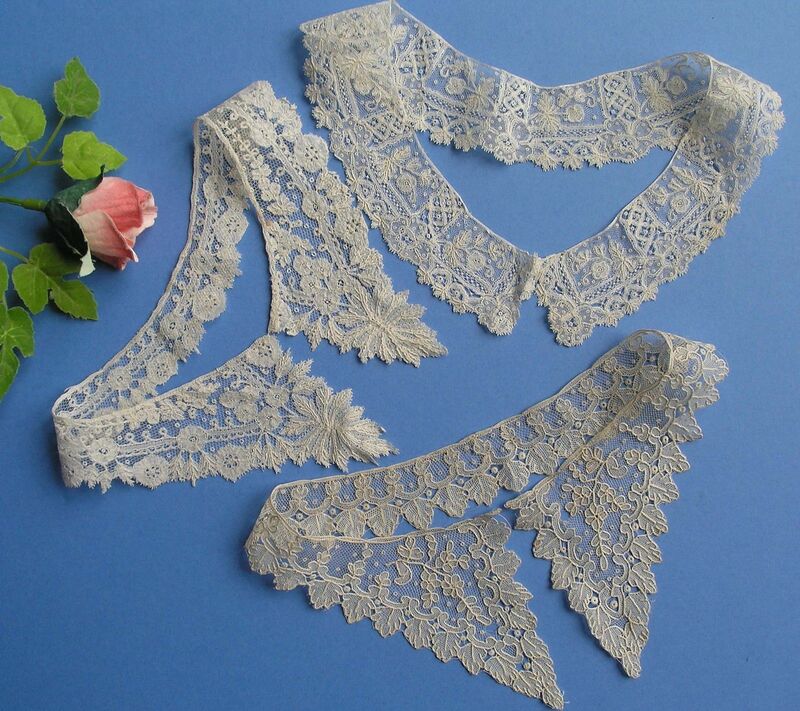 http://tinyurl.com/p3jkgzp 3 Small Delicate Antique Handmade Brussels Point de Gaze Lace Collars VERYNICE! 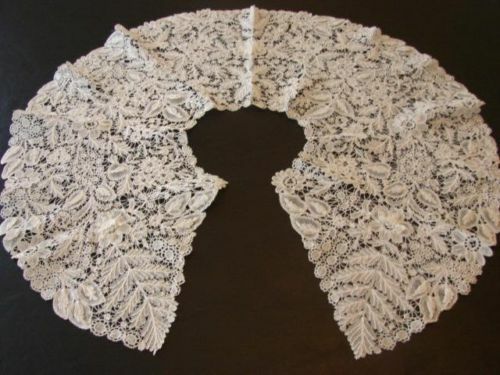 http://tinyurl.com/q73nhe4 19th C Handmade Brussels Point de Gaze Lace Front Dress Jabot or Doily LOVELY! Size: collars: 14.5″ across neckline, 1-3/8″ deep. 12.5″ across neckline, 2-3/4″ deep. 14″ across neckline, 3.25″ deep ends, 1″ center. Comments: I’ll put these four small pieces together. 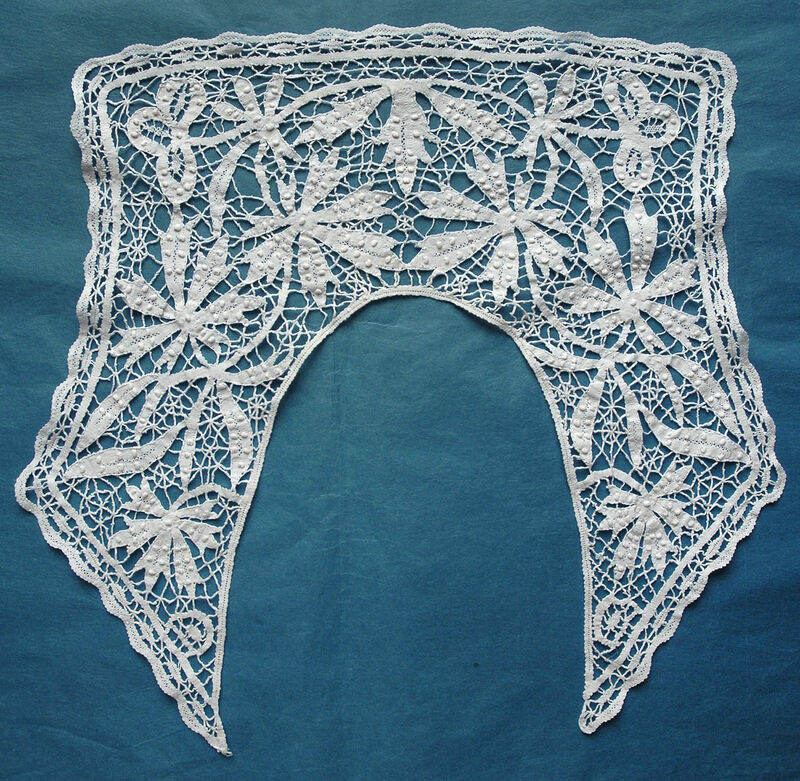 Of the three collars, two are Point d’Angleterre (late 19th c bobbinlace with Pt de Gaze ground), and the third is Point de Gaze. The little mat (not sure what it is), is Brussels Duchesse with no raised work in the center Point de Gaze insert. All together these are a nice sampling of late 19th c Belgian work. They are all nicely done, and note the good raised work in the bobbinlace in the Duchesse. I like the two Pt d’Angleterre pieces best, good small work on the bobbinlace, and one has some nice decorative ‘mode’ fillings, along with some needle-made flowers along the outer edge. Damage: Occasional pinhole in various pt d Gaze meshes, especially in the Duchesse. Some miscellaneous threads on the outer edge of the Duchesse piece. Soilage: A few light age stains in all, minor. Duchsse is a cream color, collars are ivory. Sold for $36.00, 7 bidders. Sold for $74.28, 7 bidders. 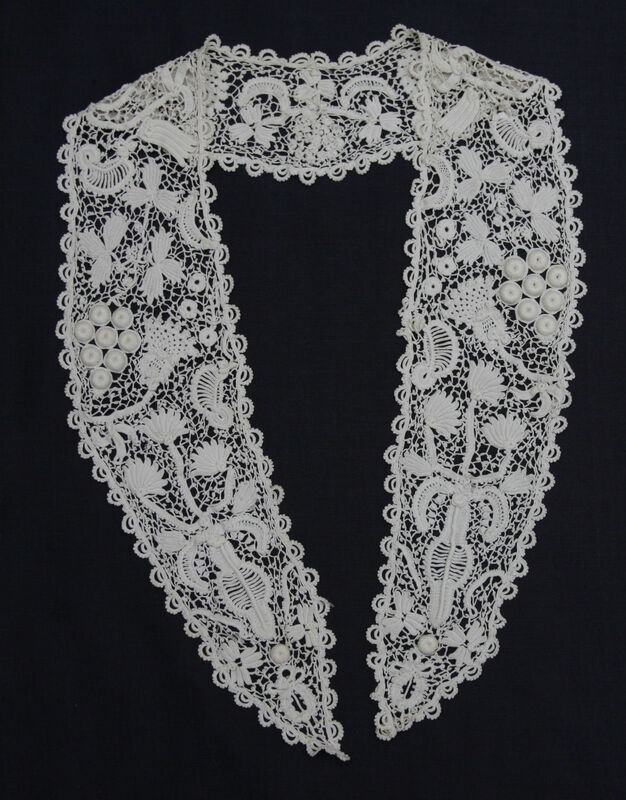 Comments: A high-end market large Belgian needlelace collar. Note the spacing of the buttonhole stitches on the raised edges, and also the insert that has a lot of Point de Gaze techniques but in a heavier thread – all marks of a Belgian product. There are a few heavy raised edges, without much sculpting in depth, another Belgian mark. Also the precis clothwork with some diamond window decoration. The little ‘islands’ where brides meet recall what you see in Bruges bloemwerk. Might be a Zele piece. Finish: There might be a fold creases center back – but it’s faint. Looks unused. Sold for $150.00, 6 bidders. 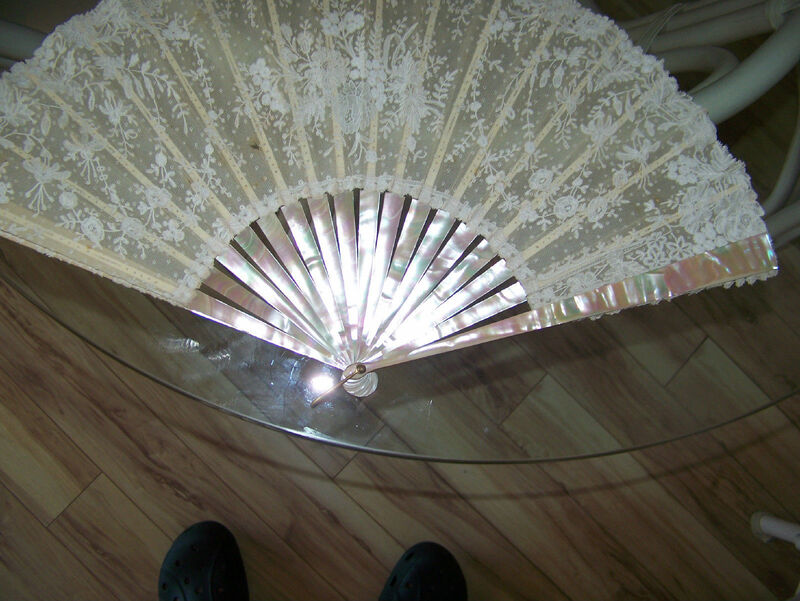 Comments: I nearly didn’t include this large fan because there are no photos of the lace from the front of the fan, which makes it difficult to access the lace. Some kind of Duchesses, but I can’t tell if there’s any Point de Gaze work in the piece. I also can’t really evaluate the pattern. But it does come with a Tiffany box, and the Mother of Pear sticks have a silver inlay. Damage: Can’t really tell – but there is one broken stick. Sold for $132.50, 2 bidders. Comments: A Point de Gaze bertha with raised rose petals. Seller appears to imply that it is a flounce with some tucks to hold it in a circle. However it looks like a regular bertha to me with properly finished ends and neckline – and I question the accuracy of the 84″ circumference. A higher end market piece with flower baskets, multiple raised petals in the roses, and some sophisticated decorative ‘mode’ fillings. It doesn’t break away from the romantic floral design, but shows some innovation. Damage: one area of holes along the neckline. Some pinholes and occasional small hole in the mesh throughout. Soilage: Some localized red staining, mostly near the holes. Sold for $271.00, 9 bidders. Comments: Material such as this is extremely rare. 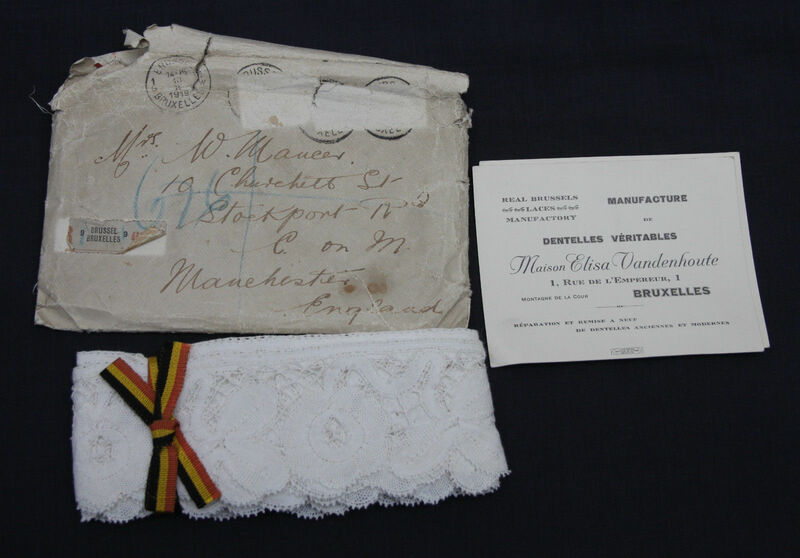 An unused border of Bruges Bloemwerk, as packaged with the original envelope from Brussels to Manchester England dated 1919 (this could be a War Lace piece), and the retailer’s card, Maison Elisa Vandenhoute. It’s not an especially remarkable piece of lace, but the package of everything together is exceptional. Provenance: Dated envelope and seller’s card. 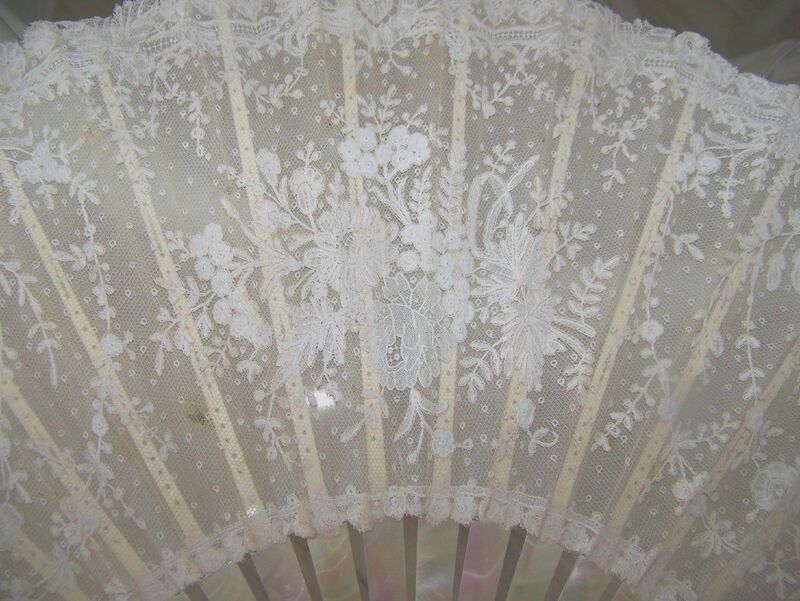 Modifications: None – can’t see the ends of the lace to tell if they are cut. Damage: Lace looks fine from what I can see. Envelope is rather the worse for wear. Soilage: Looks clean and unused. Finish: Lace wound and tied with a ribbon, red, yellow, black. These are the colors of the Belgian flag. Sold for 59.55 GBP, 6 bidders. 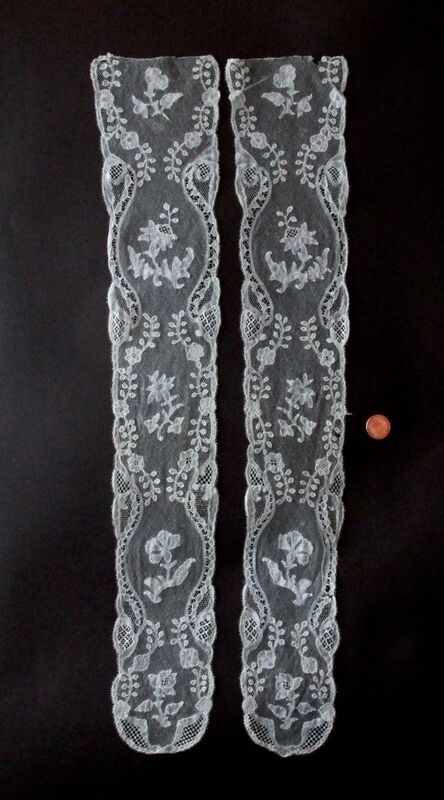 Comments: Two lappets of Brussels bobbinlace with droschel ground. Probably third quarter of the 18th century. Sometimes this is called Point d’Angleterre, probably for the English market. There’s also a slight possibility the piece could be English, but it doesn’t really have that kind of feel. The designs are fairly simple, and better pieces do not repeat designs along the length of the lappets. That’s the case here, although the tops look a little cut off. Modifications: I think the tops are cut and finished – these are a little short for lappets. Finish: Some slight wrinkling, minor. Starting Price: $10.00 with reserve. Comments: A shawl collar of Irish Crochet. Large, well made motifs with plenty of raised work. It looks to me like the picots are crocheted loops. Excellent technique with a bold design. It’s a little hard to appreciate just how large the motifs are until you see it on the manikin, and I’m not sure it is as effective as it is when laid flat. Modifications: There is some net attached to the back as a support round the neckline. Finish: No obvious creases or winkles – all very crisp and precise. $66.00, 4 bidders, reserve not met. 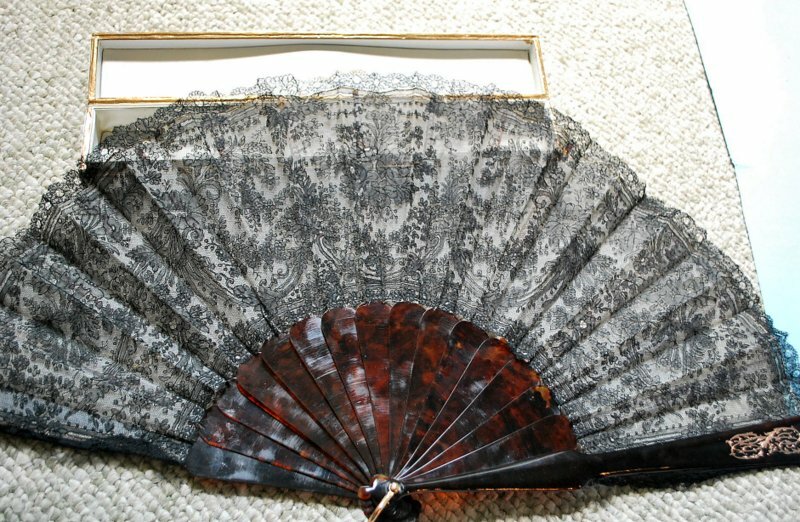 Comments: A Point de Gaze fan with Mother of Pearl sticks with a Faucon box, Paris. No raised petals, and the needlelace is very finely worked. The decorative ‘mode’ fillings are kept fairly simple, and note the interesting striped areas in the cartouches. The MOP sticks have beautiful natural color, with pierced slips, probably bone. A higher end market piece, although I’m a bit surprised that the sticks aren’t more elaborate. Provenance: Estate piece, box may not be original. Soilage: Some light brown marks on the left side and center left at the top. $360.00, 11 bidders, reserve not met. Comments: A Chantilly fan with boxed labelled “Alouise Van de Voordu, Paris”. Seller says the sticks are natural, if this means tortoiseshell, be very careful with import and export laws. There are what look like scratch marks on the sticks, consistent with folding, but I’m not convinced that this is tortoiseshell. I’d expect some warpage in in natural material. They are elaborately pierced in the slip area, with a gold monogram on the front guardstick. The lace is a finely worked Chantilly, no ombré shading, and no elaborate fillings. Note a light silk? backing has helped preserve the lace. $300.00, 4 bidders, reserve not met. Comments: A shawl collar of Duchesse de Bruges, meaning no needlelace inserts. Th is is an interesting piece, typical Duchesse motifs, but note the raised bobbinlace petals on the flowers. The raised work on half-stitch leaves is more common. Excellent technique for a design that doesn’t come off too crowded as sometimes happens in this lace. Damage: Minor broken threads as shown in the photos. Unsold as of 6/13/2015 7:21 MDT. Size: 26″ neckline, scallops ~6″ deep. Comments: A collar of what at first looks like Rosaline, but on closer inspection is look more like Point de Flandre (sometimes called ‘Old Flanders’). 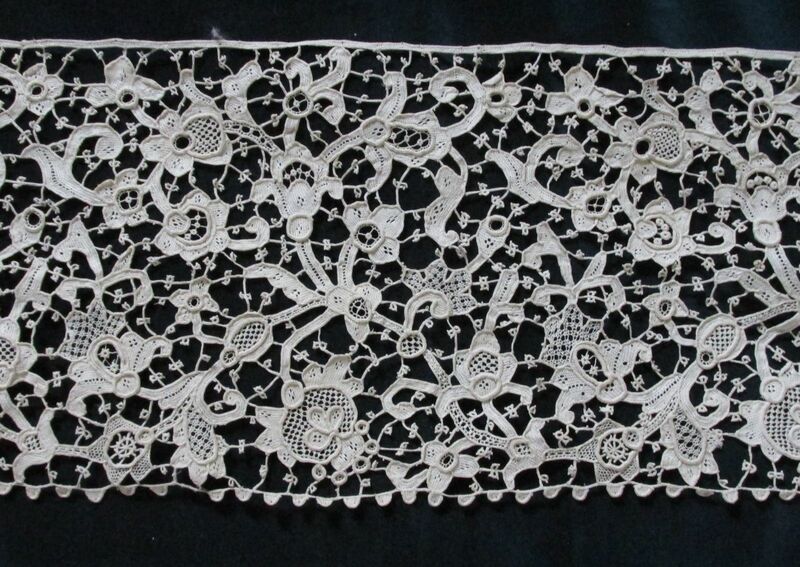 This is a pieced lace with some fairly sophisticated motifs. In this example perles such as are found in Rosaline have been added. 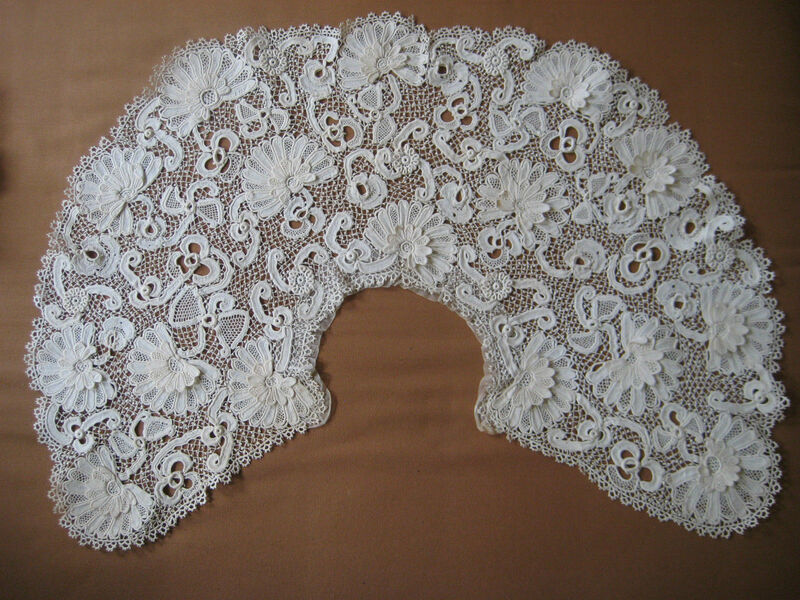 A gimp outlines the motifs, and the fillings are typical of this lace. Plaited, picoted brides. 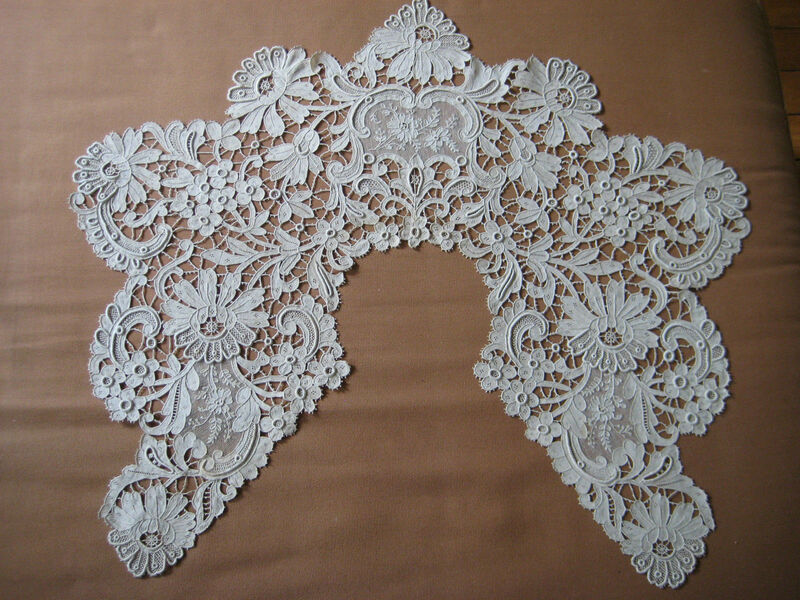 Overall an excellent example of this lace, which is little discussed in the literature, and can range considerably in quality. Size: 7″ deep, 24″ complete with additional 15-16″ diagonally cut on ends. Comments: The shape might be a little odd, but I find this a fascinating piece. Because I’m going to call it Irish Kenmare needlelace for the following reasons. 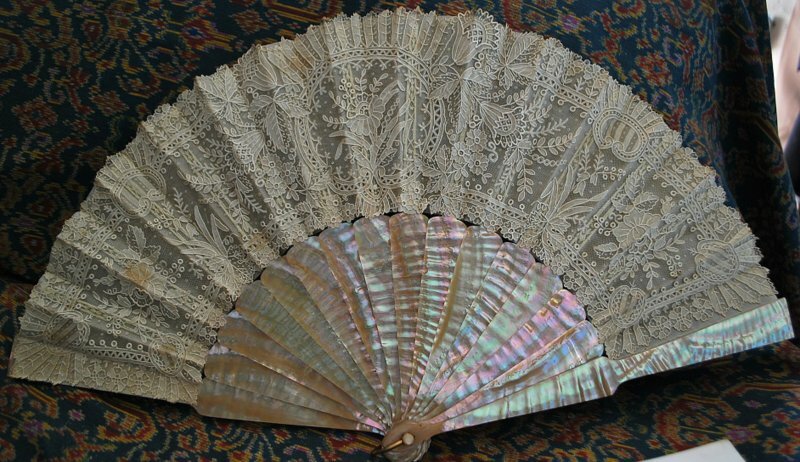 The lower edge has scallops that are very similar in form (if not in technique) to what you find in Youghal. I’m also intrigued by the fillings, which in some patterns also look like Youghal fillings. The looped picots are also similar to what is shown on the Kenmare lace site. I’ve got a good feeling about this piece. Modifications: Modified cut on ends.